You’ll notice right off the bat that the photo above doesn’t bear that cheesy “shot all crooked against a black backdrop” look that most of the other items in The Strange & Spooky Museum have. That’s because this item was so small, I needed to scan it in so you could bask in all its glorious details. 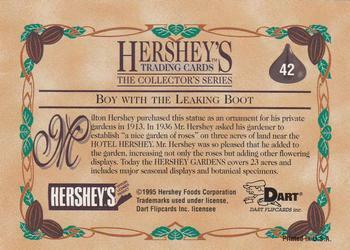 I did a little digging online and found that this set consisted of 100 cards and was released to celebrate the 100-year anniversary of Hershey’s. 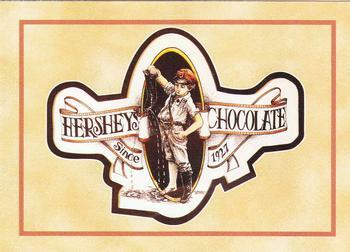 As for the cards themselves, they feature all the different tasty treats Hershey’s has offered over the years. Oh yeah, and one infamous boy with a leaking boot! You can get some additional information on the card set here. To see more amazing Boy With The Boot memorabilia, go here.